From supercars to supercarriers, when it comes to burning dollars faster than gasoline, these ten vehicles are the absolute worst. As far as road going cars its the Veyron. Its projected regular expenses are staggering for a car that is made for public (albeit very wealthy) use. $350,000 is the initial down payment according to Bugatti that you have to have in order to even consider buying one. $24,000 is what it costs to lease a Bugatti Veyron on a monthly basis. But there are a few caveats. You can only drive 2500 miles a year (technically 7 miles a day) and you can lease only for 5 years. $40,000 is what it's going to cost you just to deliver your Veyron to American shores. Yes, for the price of a 2013 Infiniti G37 Coupe, yours is just delivered. $2500 is the average monthly insurance that one owner reported on their Bugatti Veyron. $140 is the average price for a fill up of gas in the United States. City gas mileage is 8 and highway isn't much better at 13. The 1001 horsepower 8-liter engine is a thirsty beast and with gas hovering around $5 a gallon and your 26.4 gallon fuel tank, fill-ups alone are around $140. And upon delivery, there are certain maintenance items you are required under contract to do which includes a routine annual maintenance of $20,000, detailing services around $10,000, a wheel and tire replacement every 10,000 miles with a price tag of $50,000 for a set of tires. The Queen Mary 2 burns 3 tonnes of heavy fuel oil per hour at around $650 per tonne AND 6 tonnes per hour of Marine Gas Oil at around $900 per tonee, so $7350 per hour to operate. Cruising speed is about 30 mph. The cost of operating Air Force One is approximately 180k per hour. For a flight from LA to NY the average flight time is 4 hours and 47 minutes. The distance between LAX and JFK is 2,806.4 miles. 860940/2806.4=306.7773 ~ $306.78 per mile. Plus the escorts. Since the service is rolled into the Air Force's General Operating Budget, it isn't a line item. However, the service is estimated to cost between 1.4 and 1.8 billion dollars a year. Brian, The Life of knows traveling by a Space Shuttle only costs slightly more than Obama's plane! Total program cost was about $200 billion and the total miles logged by all ships was over 500 million. That means the total cost per mile was about $390. Wow. In 2010 the budget of the ISS from the US was 72.4 billion dollars. The ISS travels at approximately 17100 miles per hour, with 8736 hours per year. Divide it all out (72,400,000,000/8736=n/17100=) and you get $484.65 per mile. Just did a little Wikipedia research, so take this with a grain of salt. There are two crawlers, and they have done about 3,400 miles in their lifetimes, but I can't determine if that is combined miles or miles for each one. If it's divided, that means each has done about 1700 miles in a 47 year lifespan, giving you about 36 miles per year, and at 42 feet per gallon, it uses about 4,525 gallons of diesel per year (they have 5,000 gallons tanks). In today's numbers, fuel costs would be around $18k per year. But they require a team of 30 to operate, which isn't cheap, and I would guess the regular maintenance isn't cheap either. They drive on specially designed roads that are made of seven feet deep of Alabama and Tennessee river rock, so the costs of those might need to be rolled in as well. Therefore a trip from Reston, Va to Manhattan NY in a Saturn V would cost you a cool $17 million dollars. parking could be a problem as well. 160 million per year just for the personnel. Add aircraft fuel and maintenance parts, and you're looking at closer to $400 million per year. Add the cost of the carrier ($4.5 billion) and divide it over its lifetime (about 40 years), and you're looking at about $530,000,000 per year which is close to $1,450,000 per day. It's roughly $4000/run. I can believe that number after going to the Winter Nationals at Pomona last year and seeing a post run teardown. They throw away what looked like half the engine, there's 15 gallons of Nitromethane burned per run, 28 quarts of fuel they use for ONE RUN, the clutches are re-surfaced or discarded, the tires only last a few runs... It adds up quickly. 10 runs over a weekend and you're looking at $40k operating costs? Sure, I can understand that after seeing it first hand. The Moon Buggy was taken very far to be driven for around 18 miles. 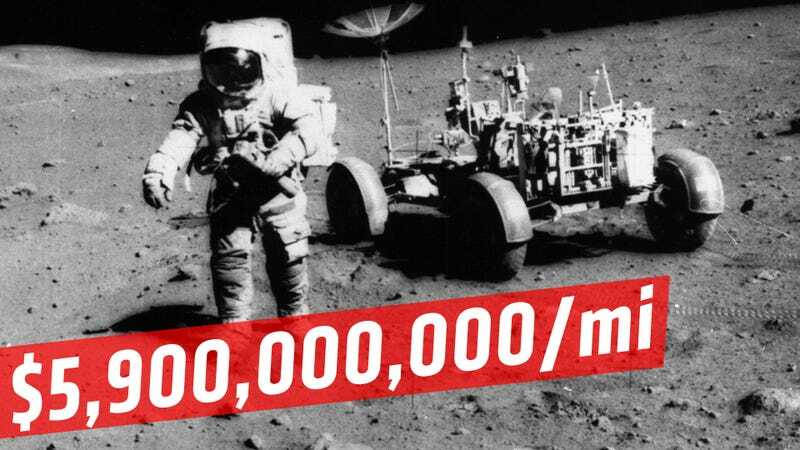 Given that the development cost was $12.7 million and the delivery cost was $17.2 billion per buggy in 1969 dollars, you're looking at $5.9 billion/mile in 2013 dollars. Knowing that makes it surprising that the Sultan of Brunei didn't buy one.